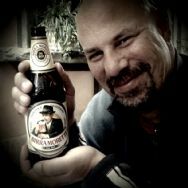 The author and an Italian beverage. And so the “Trip of a Lifetime” Mac Mania 8 cruise, co-produced by InSight Cruises and Macworld, begins with a (much-delayed at JFK) flight into Rome’s Fiumicino Airport bright and early in the morning. This particular cruise is in a part of the world I’ve always wanted to visit so when my wife (Lesa Snider King, author of the Photoshop CS4: The Missing Manual) asked if I wanted to go with her as she teaches Photoshop classes on the cruise, I jumped at the chance. The cruise, which begins on Wednesday, is a ten-day, five-country, eight-stop extravaganza through the cradle of civilization. Along with the on-board classes and activities, we will be visiting the ruins of Pompeii, the Great Pyramids at Giza, and—my most anticipated stop—the island of Santorini in Greece. We are spending two days prior to the cruise in the Eternal City of Rome, a “World City” much like Paris or New York—a city that you know and have seen so much of even if you have never visited there. The highlight of this leg will be a private, guided early morning tour of the Vatican. 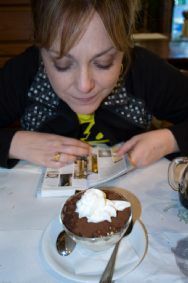 Lesa Snider King and the world's greatest tiramisu. The plan is to provide the Macworld.com readers with a glimpse inside the life of a cruise ship—we’ll have lots of pictures (which you can view via Flickr, posts and even audio interviews with many of the people teaching classes on board including New York Times technology columnist David Pogue and Apple’s Applescript guru Sal Soghoian, along with my favorite Photoshop Instructor, Lesa King. I think it’s going to be a wonderful trip—my wife can’t seem to wrap her mind around the idea that Rome is a 2,500-year-old city…. To be honest, I have a hard time with it myself sometimes. But for now, I’ve officially been up and mostly awake for almost 36 hours… it really is time to have a nap. Mac Mania 9 sets sail July 11, 2009, to Japan, South Korea, and China. For more information, visit the InSight Cruises Mac Mania 9 information page.